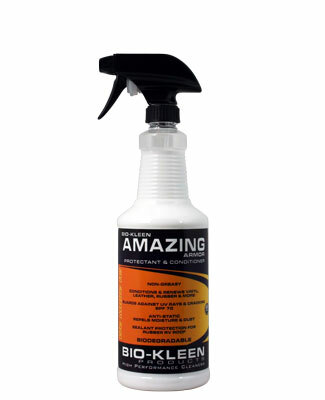 Bio-Kleen Amazing Armor is a biodegradable, non toxic marine, rv and auto vinyl conditioner and leather protectant. Non greasy formula that protects, conditions and shines vinyl, leather, rubber, plastic and finished wood. Guards against ozone, ultraviolet rays (SPF 70) and oxygen destruction that cracks and hardens these materials. Applications to rubber RV roof will reduce chalking that causes white streaks. Forms an anti static, micro thin layer of protection that deters water, airborne pollutants, stains, dust and dirt; prolonging the time in between cleaning and making it easier to clean the next time. Shine and protect automotive interior dash, vinyl's and leathers. Excellent for boat, RV, automotive and household items. Use on: marine vinyl, vinyl seats, leather seats, tires, bumper guards, trim, dash boards, vinyl tops, rubber RV roofs, vinyl furniture, luggage, shoes, golf bags, purses and much more.